In chemistry, the term "surfactant" is used to describe a chemical that reduces the surface tension of another compound. While this may not sound all that impressive, the decrease in surface tension allows surfactant-based compounds to penetrate dirt, grease, oils and stains, dissolving stubborn residues and effectively removing them from surfaces. As a result, surfactants are found in a number of everyday household items. Soap is one of the most common household surfactants. Everyone wants a closet full of clean, fresh and static-free clothes. To help turn this wish into a reality, many laundry detergents and fabric softeners add surfactants to their formulas. In detergents, these chemicals reduce the surface tension of water, allowing the cleaning agents to penetrate the fabric and break up sticky residues and unsightly stains, leaving garments clean and bright. Fabric-softening surfactants surround fibers with a light layer of lubricants, successfully removing static cling while plumping and softening the fabric. Dish-washing liquids and dishwasher detergents are two of the most common sources for kitchen surfactants. In these compounds, surfactants create loads of suds and leave dishes sparkling clean by breaking up baked-on grime and dissolving fats and oil. While they are not deactivated by hard water, homes with water that contains a high percentage of minerals may require additional soap to achieve satisfactory results as the surfactants readily attach themselves to the raw materials in the water. Soap, shampoo, hair conditioner and toothpaste all contain surfactants which gently cleanse the scalp, skin, hair and teeth. These compounds create a pleasantly foamy reaction when mixed with water. The suds and bubbles help the water get beneath oil, dirt and debris, allowing the unwanted compounds to be washed away during rinsing. Additionally, surfactants are found in shaving creams where the decrease in surface tension reduces the friction generated by the razor blade, resulting in a smoother shave. Surfactants are found in many everyday household chemicals, such as carpet shampoos, multi-surface sprays, glass cleaners, toilet-bowl cleaners and hand cleansers. These products have many practical applications and can make housecleaning tasks less laborious; however, there are some concerns about the safety of surfactants as they can be toxic at certain levels. For the best results, always follow directions on the package and never use more of a compound than the situation requires. 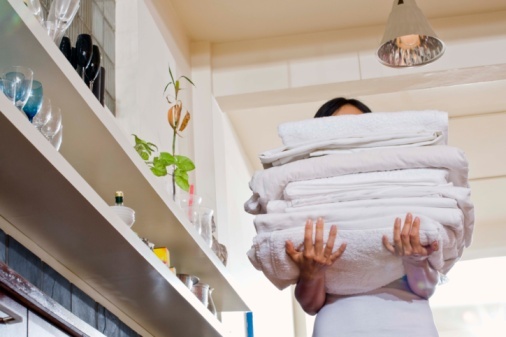 What Are the Dangers of Fabric Softeners?